Jillian Fazioli, our Newport, RI Store Manager, and head buyer of our Newport, RI store. 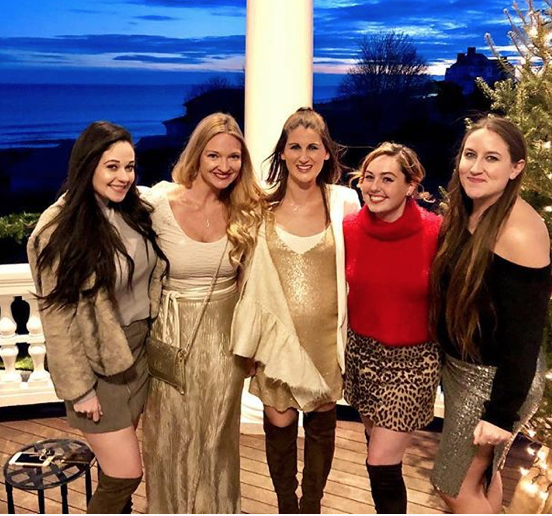 Jill is responsible for finding all of those fabulous going out clothes for our Salve college girls as well as the perfect dresses for weddings and special occasions and the perfect pieces to keep your wardrobe both trendy & fun. Jill graduated URI with a Bachelors in Textiles, Merchandising, & Design and is just as beautiful as she is sweet. She loves styling everyone who walks in from head to toe in the perfect outfit. Rochelle LaRue Gallo, owner of Rochelles, Inc. has two beautiful daughters & an amazing & tech savvy husband and she currently operates & works in all four locations in RI & CT. Rochelle opened Rochelle’s during her sophomore year in college at 19 & has always had a passion for fashion and love of people. She began her retail career in her parents clothing stores in Watch Hill at the age of 14 & continues to honor her late father, Richard Fiorini, who lost his battle with brain cancer in April of 2010. She loves all aspects of her career from hand selecting the beautiful merchandise from her travels around the world, to creating beautiful in store displays & most of all dressing her amazing customers who have been shopping with her since her first year 17 years ago. She loves her job today just as much as when she started and graduated URI with a Bachelors in Textiles, Merchandising, & Design. Rachel Intrieri, Store Manager overseeing both Mystic, CT & our Watch Hill, RI locations is a head buyer for these locations and specializes in finding those perfect pieces for our working customers wardrobes as well as styling all customers who walk through the door from head to toe. Rachel currently has a beautiful little boy & another one on the way. She loves to play dress up and has a sense of humor that will lighten any mood. Rachel graduated from URI with a Bachelors in Textiles, Merchandising, & Design. Meghan Hannon, Assistant Store Manager of our seasonal Watch Hill, RI location and our Mystic, CT locations in the off season, is as quirky as she is fun. She is a head buyer for our Watch Hill, RI location but you'll see her working in all four locations. Meg has a funky style and will be sure to dress you a little bit outside your comfort zone. She is also very active with our online store as well as our social media accounts. She has a Bachelor's in Journalism at Salve Regina University. Alexis Castelli, Assistant Store manager of both Mystic, CT locations as well as a head buyer of these locations both on Main Street & Cottrell Street. She is responsible for the beautiful displays & merchandising you will find at both of these locations. She is newly engaged and her favorite color is black, which she will dress you in from head to toe if you let her. Alexis has a bachelors degree in Fashion Merchandising & Retail Marketing at Johnson & Wales University and a Masters in Fashion Communications.